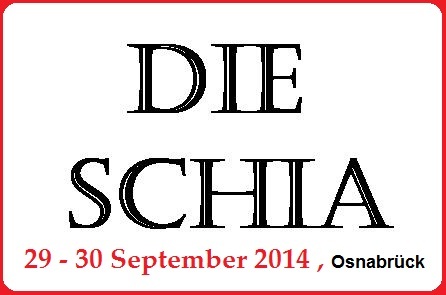 JNN 8 Aug 2014 Berlin : A two-day conference on Shi’ism will be held on September 29 and 30 in Osnabrück city of Germany. According to IQNA’s branch in Europe, the conference has been planned by the Theology Faculty of Osnabrück University. The program aims to introduce Shi’ism, which is the second largest Islamic school of thought, and Shia Muslims to the world. Principles of Shia beliefs and theology as well as Shia teachings and necessary information needed to interact with Shia Muslims will be discussed at the conference. Islam is the largest minority religion in Germany. According to a national census conducted in 2011, 1.9% of Germany’s population (around 1.5m people) declared themselves as Muslim. The large majority of Muslims in Germany are of Turkish origin (63.2%), followed by smaller groups from Pakistan, countries of the former Yugoslavia, Arab countries, Iran and Afghanistan. Most Muslims live in Berlin and the larger cities of former West Germany. This entry was posted in Europe and tagged Europe, Germany, religion in Germany, Shia Muslims, Shia Population, shiism, Theology Faculty of Osnabrück University. Bookmark the permalink. THIS IS EXTREMELY GREAT NEWS . THERE SHOULD BE SUCH CONFERENCES EVERYWHERE, WHERE SOME MUSLIMS LIVE . ISLAM IS VERY ILL INFORMED AND THE MUSLIMS ARE IN GREAT MISGUIDANCE . I WOULD HAVE LOVED TO PRESENT MY PAPER ”HISTORY OF ISLAM FROM ADAM TO AAKHIRUZZAMAAN” WHICH HAS BEEN ALHAMDOLILLAH HAS BEEN MUCH APPRECIATED.